Home Automation Systems and Trends Explored – Back Bay Shutter Co. While motorized shades and window treatments are, perhaps, the most common automated home accessory, they are just one part of a broader concept in architecture and interior design: home automation systems. With the forward leaps and bounds made in digital technologies over the past decade, home automation systems are becoming increasingly complete, convenient and affordable for homeowners. Home media systems – Create music playlists, access media libraries, control CD and DVD players and activate home entertainment and gaming systems with just the touch of a button. Lighting – Automation can be applied to both dimmer switches and activation switches, giving you pinpoint control over both interior and exterior lighting. Lighting automation systems can also be programmed to turn lights on and off at pre-set intervals, and they are idea for boosting security when nobody is home. Security – Today, the most advanced home security systems make use cameras and online media to give you a complete view of all activity in and around your home. Automation systems can be used to activate or deactivate certain angles, views and features, or access your security system remotely. Design accessories – In addition to window treatments and motorized shades, you can automate security gates, doors, windows and more, if desired. In addition to these applications, automation systems can also be linked to your home’s HVAC appliances, giving you effective tools for managing your home heating, cooling and humidity control. Some home automation systems providers such as Lutron even have apps available for mobile devices such as iPhones and iPads. 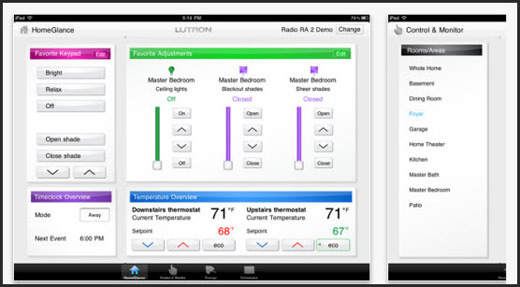 Here’s a screenshot of the Lutron iPad app. 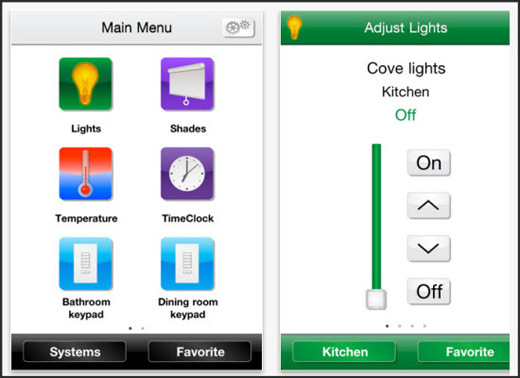 Learn more about the Lutron Home Control apps. The benefits of home automation go beyond the obvious comfort and convenience they provide. With particular applications, including lighting and home surveillance and security systems, automation makes your home a safer place and provides an effective defence against prowlers and break-ins. Home automation systems also hold the potential to cut down on your energy usage and utility costs. By linking your lighting to automated controls, you can greatly reduce or even eliminate electricity wastage on lighting, all while giving you the ability to create the illusion that people are home when they’re not. Automation systems which are linked to HVAC appliances and devices help you decrease your home heating and cooling costs, which account for more than 50 percent of all annual energy usage in a typical household. If you are interested in automating your home, it is suggested that you generate a list of all the electronic devices, media players, lighting controls, accessories and appliances you wish to automate. Then, contact a reputable home automation company to request a consultation. A customer service representative can discuss your needs and desires in detail and, if necessary, arrange an in-home consultation session to gain a firmer grasp of the practical requirements of the automation project. From there, you can get a price quote, and adjust the components you wish to automate until installation costs fit your budget. Attribution: Screenshots of the Lutron Home Control+ apps by Lutron Electronics Co., Inc. are available through iTunes as shown on the iTunes preview page here.